Published June 19, 2017 by admin. Are you aware that sunburn in childhood or adolescence can double the risk of developing melanoma, a lethal form of skin cancer in later life? 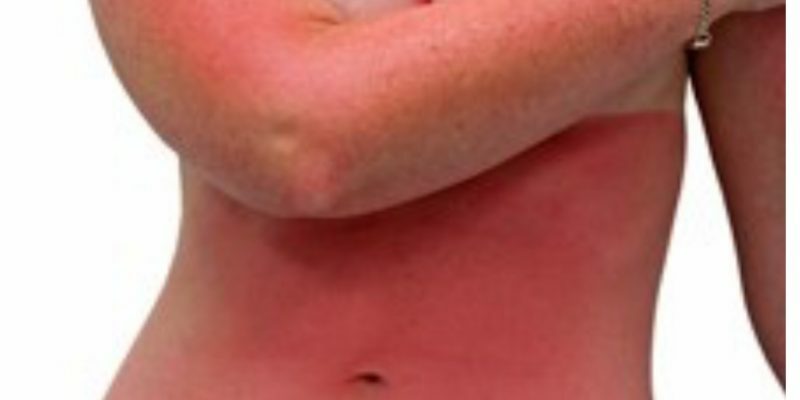 So how should you deal with sunburn if you have been burnt over the weekend? Our Dermatology Nurse Consultant, Sue Ibrahim, explains the immediate first aid steps you need to take…. Cover up the affected areas and stay in the shade until your sunburn has healed. Wear loose cotton clothing that allows your skin to breathe over the sunburnt areas. Analgesia or painkillers can help relieve the pain and reduce inflammation caused by sunburn. Nonsteroidal anti-inflammatory drugs such as ibuprofen are ideal and should be continued for a period of at least 48 hours if there are no contraindications. Paracetamol will help with pain but has little effect on inflammation. Apply a cool compress to the skin such as a towel dampened with cool water for 15 minutes, or take a cool bath or shower. Aim to keep the temperature just below lukewarm. Make sure the shower has a gentle flow of water rather than being on full power. If blisters are starting to develop, then a bath is preferable. Do not rub your skin with a towel, but gently pat it dry when you get out. Aloe vera or soy-containing gels or lotions can be beneficial in soothing the skin. Aloe vera not only has a cooling effect on the skin but also acts as an anti-inflammatory. Be wary of using creams or lotions that contain petroleum, benzocaine, or lidocaine. These can either trap heat in the skin or cause local skin irritation. Remember sunburn can cause long-term damage to the skin and prevention should be the key. For further information about skin cancer and its prevention, make an appointment to see our nurse consultant in dermatology who can discuss sun-protection and mole monitoring with you in detail.